I meant that as two different things. Two of my favorite flavors, but not combined into one. I’m not sure how that would be. I seriously love my doughnut pan. So far, it has done no wrong. 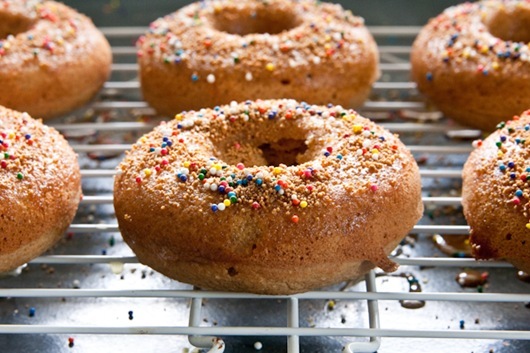 And somehow, randomly, I came up with a flour mixture that makes real.deal.cake.donuts. 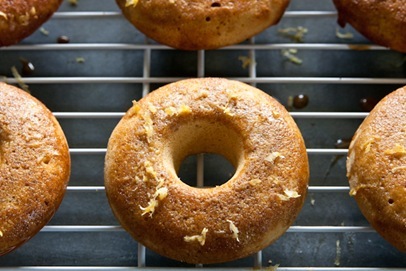 For the lemon cake donuts [or is it doughnuts? ], I kept the topping quite simple. No, that is not chocolate glaze. It’s sucanat powdered sugar glaze. Remember when I turned sucanat into powdered sugar? 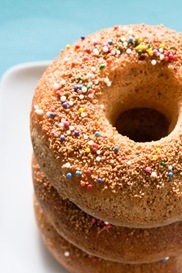 You can do it with plane pure cane sugar as well! I wanted this version to be thinner than the typical glaze like frosting. 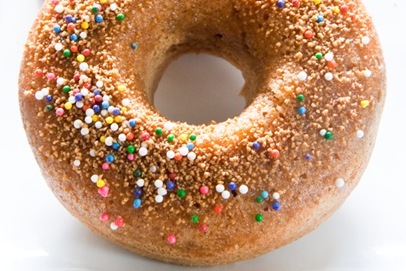 I wanted it to soak into the donut, and not sit on top. Then, top it all off with a touch of freshly grated lemon zest. A surprising burst of lemon all the way through this donut. No hint of dryness here! In a small bowl, whisk together eggs, milk, vanilla extract, lemon extract, oil + applesauce. Fold in the lemon juice + zest. With a spoon, spatula, or piping bag, transfer the batter to your greased pan leaving a little room at the top. Test with a toothpick for doneness. You want a slightly moist toothpick. Not gooey but not bone dry. 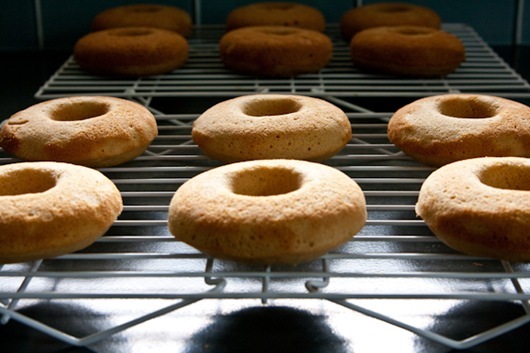 The tops of the donut should be golden brown and it will spring back when you press it lightly. *If you don’t have lemon extract, add 1T extra lemon juice + 1/2T extra lemon zest. Not exactly the same but it will work. Whisk powdered sugar + milk together until smooth. Let sit 2-3min. 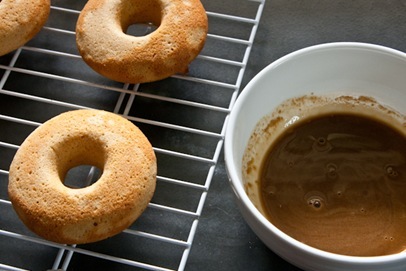 Dip donut into glaze on both sides. Sprinkles with lemon zest right away, so it sticks. Let dry + soak in on a cooling rack. These are a bit messy! You can dip one side if you prefer. Gluten free, but no one will ever have a clue. I know that looks like a long recipe, but I just like to provide you with details. Honestly, they take about 10min to prep and max. 20min to bake. They’re ready to go in no time at all. Ever since I was little, I’ve always had a thing for cinnamon. 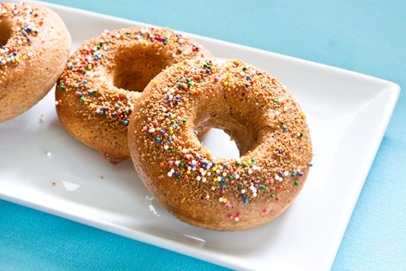 Not only are these topped with cinnamon + sucanat + sprinkles, but they’re loaded with cinnamon on the inside too! 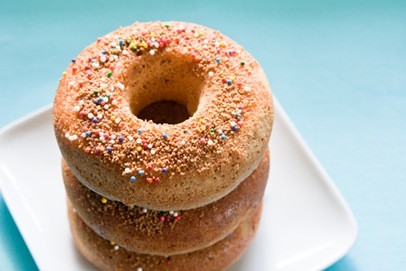 While I was extremely excited about how the lemon donuts turned out, there was something a little more nostalgic about the cinnamon sugar donut. Maybe it was my memory of eating cinnamon sugar donut holes from Louie’s Bakery in Marshall, MI growing up. Yeah, I’m pretty sure that was it. These aren’t fried, and they’re not made with lard, but I must say, they are quite edible. They’re also completely gluten free + don’t fall apart…at all! And the sprinkles? Well, they're just so fun! In a medium sized bowl mix together the oat flour, sweet rice flour, coconut flour, sucanat, salt, cinnamon + baking powder. In a small bowl, whisk together eggs, milk, vanilla, oil + applesauce. With a spoon, spatula, or piping bag, transfer the batter to your greased pan leaving a little room at the top. It should fit 6 perfectly. In a cereal sized bowl, melt the butter. Combine sucanat + cinnamon together in a small bowl. 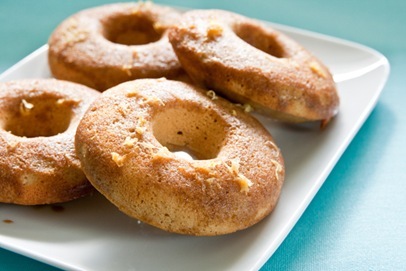 Dip the top of the donuts into the butter and place on a cooling rack. Both batches of donuts, were prepped, baked, topped + ready to go in just over an hour. Not bad! Don’t forget!! 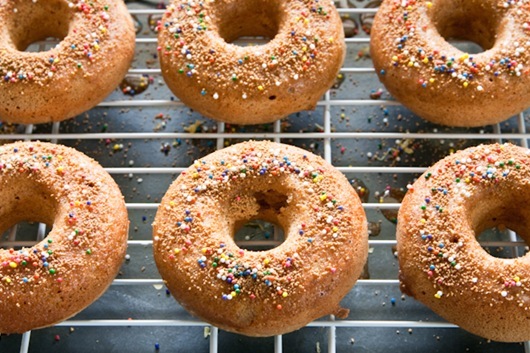 If you don’t have a donut pan, just use 6 muffin tins. They’ll take about 4-8min longer to bake, but will have the same cakey consistency. 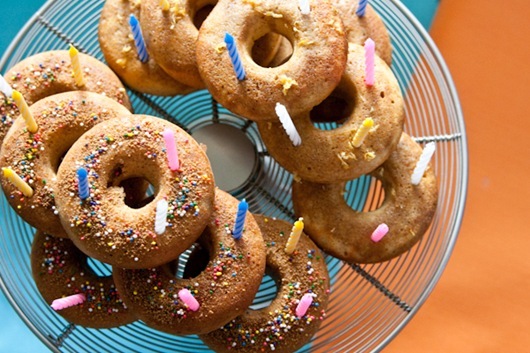 Who says you can’t make a birthday cake out of a dozen cake donuts? oat bake birthday breakfast cake!